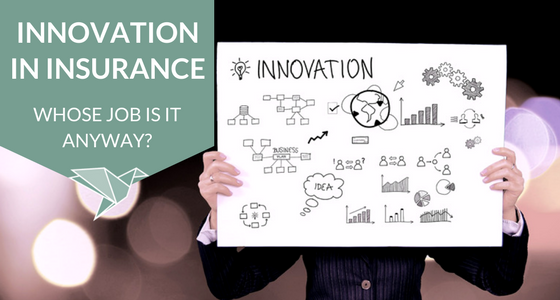 The Progress Partnership – Innovation in Insurance – whose job is it anyway? The Progress Partnership / Business / Innovation in Insurance – whose job is it anyway? 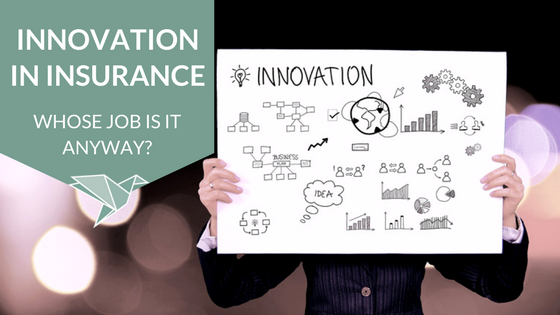 Innovation in Insurance – whose job is it anyway? Everywhere you go, people are talking about “innovation”. There are conference sessions, reports, brochures, and new “Head of Innovation” job posts popping up all over the market. But what exactly is “innovation”? Let’s take a common-sense definition : a process of finding novel solutions to important problems. So ironically, innovation is actually nothing new, as this is exactly what the insurance market has been doing since 1688! Why all the fuss now? How does innovation really happen? We tend to think of innovation as arising from a single brilliant idea, a Newton-esque “apple on the head” moment, but the truth is that these ideas are often the result of a drawn-out process. First, there is detailed research and data mining to unearth valuable insights and to accurately define the problem you wish to solve. After this, you design and engineer a solution and follow that with critical testing to ensure that solution delivers exactly what is needed. This process is almost never achieved by one person in isolation, so even if an organisation has a “Chief Innovation Officer”, don’t for a moment think it is their job alone to come up with all the bright ideas. Is collaboration your new competitive advantage? In a market that has built itself on specialism, collaboration has not historically been top of the “required skills” list when appointing a senior underwriter or selecting a broker. But the world has changed; it’s more interconnected than ever before and people can achieve things collectively that they simply cannot do alone. Just talking to your clients, colleagues, and competitors can spark valuable insights. Not to mention, having regular interaction with other product lines, and even (gasp!) their clients, which exposes you to new perspectives, avenues and opportunities to innovate. In today’s market more than ever, if you as an individual embrace collaboration, your career will reap the benefits as you will be recognised and rewarded. Those who reach across the silos to collaborate, help others, broaden their own knowledge and innovate together to solve today's emerging issues are the ones who will lead us into the next iteration of the market. And what of organisations who encourage, facilitate, and reward this behaviour? Well, they will streak away from the competition faster than Jessica Ennis-Hill in the parents’ race at sports day! By differentiating themselves with new insights, collaborations and the solutions to mitigate emerging risks these forward thinking companies will stand out and thrive in an ever-more competitive industry. So, whose job is it…? If you are a risk professional working in any part of the market today, then it’s time to realise that innovation is your job. It is also your opportunity to shine. Risk managers: You need to find advisors you trust, open up to them about your business, and invite them to help. (Re)insurance brokers: It’s your job to get under the skin of your clients’ businesses to uncover their real exposures, and find out not just what they think the issues are, but why these issues matter so that you can work together with insurers to design solutions. (Re)insurers: It’s your responsibility to mine the rich seam of data that your organisations hold and use your technical knowledge to discover trends and make predictions that can inform your new product development. And importantly, all of us need to work together; to pool our collective skills, collaborate, and create the solutions that today’s businesses desperately need. If we want to see more innovation, and we certainly all need it, then it is time to step up. Innovation never comes easy, but it will come a lot faster if we work together. Do you want to progress your career in the insurance or reinsurance market? Pop your name & e-mail in here & I'll share all the best kept secrets! Ps. We hate SPAM as much as you and will always keep your e-mail address safe. This is a masterpiece in so many ways. Content, scope, breadth and depth come to mind. No one has discussed this issue, the way Katherine has. Not a stone was left unturned. A true insightful, well thought out and developed article. Thank you so much Meyer. I really appreciate your review, especially as you spend your days developing innovative analytics in the sector!